What motivates an angler to to seek a certain fish, not just today but almost every time he has such opportunity. I'm going to try and give you some of my thoughts on just what motivates me. Many of the reasons can be seen in the photo above. A still, late October morning while the forest is just coming to life. The stream as it continues its flow to the eventual meeting with the sea. A broken down rock wall, made by past generations to perhaps keep someone or something out, or maybe to keep them in. The colors of a tree, its foliage hanging on giving the anglers mind a chance to take it all in before its gone. 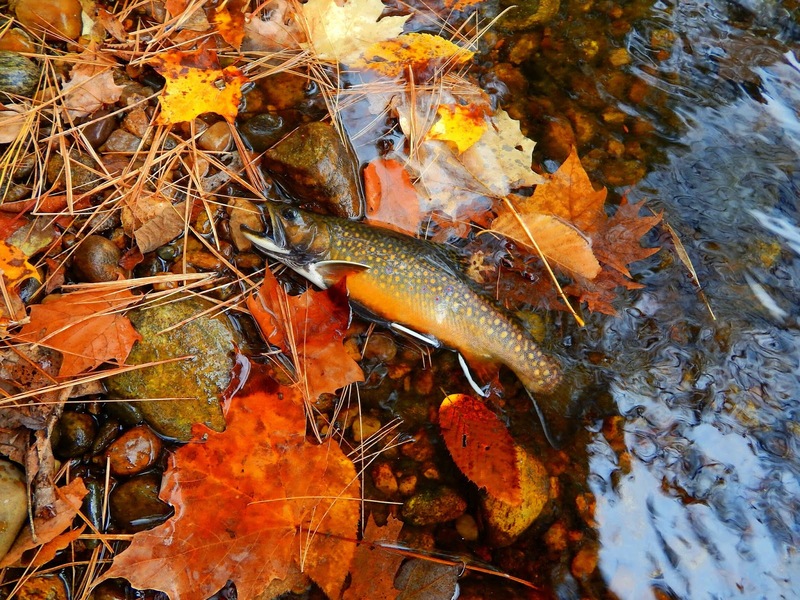 Many claim that seeking the wild brook trout that call this home is done so because of the willingness of this native to take any offering put forth. This may be true and the reason for this might be because he has learned that to survive for thousands of years in some of the most infertile waters he has to eat most everything that may float by. What excites an angler when his quarry is so small? What is derived from sliding your hand into the water and lifting a palm sized collection of dots, and halos, and lines of camouflage? To slip a tiny hook adorned with simple materials of feather and hair from the native. To admire for a moment its absolute beauty and place it back into the dark swirling waters of its home. That's some what motivates me to seek this native. My next brook trout will be just as exciting to me as my first. It never ends and I never tire. I know it's only the end of October, but it's not to early to give some thought to where the "crew" will meet up to fish and feed on New Years Day 2015. The annual event was started in 2011 and this will be our 5th meeting. We usually pick a small stream and meet about 9 am. Coffee is served with donuts and then it's off to try and coax a cold trout to take a fly. About noon we meet up at the parking area and start lunch. In the past lunch has been sausage and peppers, meatballs, venison chili, and homemade chicken soup. So I would like the "crew" to start thinking about a stream, as well as a menu. If my readers have a suggestion as what to have for lunch please run it by. I went out for a few hours mid week to see if I could coax a few trout into taking the fly. The day was kind of drab and cool and the last of the leaf displays were in show, although well past peak. The stream was in good shape and the trout were not in the pools but in water that was on the move. They were not receptive to dry flies, the Bomber and a Stimulator went unmolested. As soon as a wet fly was sent into action the strike rate went up. While the amount of hits to hookups was not record breaking they were enough to keep this angler happy. These little guys were in various places along the stream. They grow in clusters and are a brilliant green. I don't know what they are called, but I'm sure one of my readers will give me an answer. This is the fly that was the work horse today. About as simple as it gets. The rusty antron dubbing was key I believe. In this run I played with a brook trout. The first drift near the rock brought a nice hit. Momentarily the fish was on, then he was gone. Even thought the water is but 8 to 10 inches deep I could not see the fish. This happened several times, and what surprised me is that he attempted to take the same fly. I decided to rest the run for awhile and moved on upstream. On my way back I attempted to fish here again. I sent the fly out and as it drifted past the rock the brookie hit. This time I saw him and this time he was hooked. He ran up and down the little pool. The brookie knew where to go to find safety and tried very much to go there. In the end the rod was the winner and I had in my hand a jewel. A quick photo and he was off. Hook, TMC 3761 #14...Thread, Hot Orange...Dubbing, Gray Superfine dubbed sparsely so that the orange thread shows...Thorax, Rust antron dubbing...Hackle, Partridge. Good morning folks, I hope you are well. This is a post about some odds and ends that I have been meaning to let you know about. So as I get on about it I hope you'll enjoy a toasted corn muffin with butter and maple syrup and a fine cup of coffee. This is an enjoyable read. It's written by Bob Romano. Bob lives in New Jersey and owns a camp in Maine. The book tells of camp life as well as his stories of some of the wonderful fishing to be found in the Rangeley region. I had the pleasure of meeting with Bob and wife along with his father in law. It was on a small stream in the western Maine mountains. Even if you never fish this area you'll still find the book enjoyable. The next two books both written by Steve and Gale Loder. They are well done books with very valuable information on all one needs to know on handling deer from field to table. It tells how to handle deer in the field, which is the crucial first step to "quality venison". Easy to follow instructions on how to process your deer, cutting, wrapping, and storage. It has an extensive recipe section. These recipes are my kind of recipes, they are pretty simple and do not require those expensive "gourmet" seasonings or fancy ingredients. The book is bound in such a way that it lies flat for easy reading. Steve adds some wonderful deer tales to go along with the fine table fare in the book. Below is a link to a fine article on fishing wet flies in small streams. It's written by a gent who has fished a small stream from time to time. Check it out. Several years ago while thumbing through the Connecticut Atlas I found an interesting looking small blue line. The stream was not a far drive from home and from the maps showing it looked to be a not to bad of a walk to access the brook. The stream flows through parts of public land and parts of private land. So yesterday I decided to do some further exploration of this little stream. After coffee I left my house around 9 and was at the parking area at 10. The parking area is shared with hikers and walkers. I was geared up in a few minutes and off to check it out. One thing I picked up on was the surrounding woods were mostly of hemlock and stands of mountain laurel. There were a few hardwoods in the mix and they were located on the ridge. The stream was flowing with ample water. I placed my hand into it and could tell it was cold. This freestone stream has a gentle gradient and access to the water along its course was pretty easy. As you can see the the stream is not brushy and casting with my 7 footer was not a problem. By the way some of the hemlocks here have been around many years. Some of them were quite impressive in size. The stream is a series of pools, some of which are quite deep, and runs and riffles. The bottom is covered with mostly stone with a few large boulders. Some of the pools were silted and leaf filled. The first series of riffles answered the question "are there any trout in this stream". The wet fly stopped its swing and the brook trout was on. This little spotted wild jewel was the first of many. There were no prime locations, fish were in almost every part. Fine spots, glorious reds, and blue halos dominate, as does the large squared tail. I came upon a few of these waterfalls. They emptied into some beautiful pools. In some of the pools were brook trout as these. A mini gorge. Looks part of natures creativity and perhaps part mans. The water was very deep and the currents a bit tricky. The fly did strange things, and that brought a strike or two. I only fished a quarter of this streams length. I was very happy what I had found. Further exploration is planned. October is probably the best month to be along a stream. The fall colors abound, many trees are at peak. There is usually ample water and the worry of heat is all but gone. It is also a month of transition. Trout are looking for potential places in which to start the next generation, and at times will not take a fly. They can be located in unusual places in the stream and presenting a fly can be a real challenge. But with some stick to it mentality you can usually catch a fish. Friday was one such day, a beautiful sunny day that proved to be on of Octobers best. The brookies were hiding in the leaf jams at the back of the pools and runs. Several attempts to coax one to a Bomber proved a negative. Several other known brookie dries achieved the same fate. I could have put on a wet fly, maybe a Picket Pin or Cahill and had success, but today was a classic dry fly day. I went to the box and pulled out a parachute Adams. This fly is easy for the angler to see as well as the fish. See it they did for soon there were several swiping at it. There are but 2 weeks left in this grand month and I hope to get my share of time on such a stream. Please email me at uppahdam@aol.com and give me your address. Those of you who read this blog know of my love of small streams. Lately these little waters have come on some tough times. The lack of rain in the last month have brought their levels to a very low state. thankfully the air and water temps have been good and as sure as they receive some rain they will be just fine. Over the years I have fished the Farmington river many times, I mean many times. It's a tremendous resource, a cold tailwater that has been very stable. Over time this river has come to be a river of natural reproduction for both brown and brook trout. Each one seems to have its preference of locales within the river. I have been lucky to have found several places in the Farmington that are brook trout favorites. Yesterday I took a few hours to fish the Farmington. It and the brookies did not were very favorable. The weather was a bit iffy, some sun, some clouds some rain. The leaf hatch was also in full swing and hookups were quite frequent. Wet flies and soft hackles were the flies of the day. Places like this provided brook trout. They hit this soft hackle pretty well. Peacock body, orange dub hot spot, and a turn or two of hen hackle. Like fishing a small stream in a large river. Autumn along the Farmington. Wild beauty in every way. Sausage varieties, labor of love. A few weeks ago while cleaning out the basement I came across a small cardboard box. In this box I saw what was a set of new knives for my small hand grinding machine. Oh happy day, the knives I have been using have become quite dull. So with my new found tools I had the notion to make some sausage. On Saturday morning I went shopping and bought some pork butts, and some chicken thighs, along with hog casings. I had already taken out some deer meat from the freezer and had it defrosting. When I got home the love started. Boning out the pork butts, and separating the sausage cuts from the grilling cuts. Boning out the chicken thighs and removing the skin along with the visible fat. The deer was also cleaned of the silver connecting tissue and cut up. My plan was to make three varieties of sausage, English Bangers, which are a pork sausage with fresh onion. Chicken sausage with Italian seasonings, and deer and pork sausage also with Italian seasonings. A few hours later and the sausage was made. I like to let the finished product set in the fridge uncovered over night to allow it to dry some. Sunday night we enjoyed the Bangers with mashed potatoes. On the stove cooked and ready for future meals was the chicken and the deer sausage. It was slow cooked in a tomato sauce. Bangers with mashed potatoes. These sausages are also great breakfast fare with fried spuds. Chicken sausage, along with deer sausage that has been cooked in tomato sauce and served over angel hair pasta. This is one of my favorites. Sausage on Italian bread. A big pot of sausage and sauce was made and some of it was put into containers and set in the freezer for one of those cold days that are surely ahead of us. On a recent visit to Red Brook, which was not long enough, the last morning of fishing was at hand. We had decided to fish a half hour or so then visit a local breakfast emporium and head home. The place chosen to fish was close to the parking area and I was not going to put on waders. The pool was right at the mouth of Buttermilk Bay. The tide was on its way out so the pool was quite clear, at high tide it can be a nightmare with all sorts of salty debris. The skies were cloudy with the sun doing its best to make it through. A breeze was moving up the brook and it made ripples in the back end of the pool. I was of the mind set that this had been a really good trip and the amount of brook trout to hand was one of my best. I cast the streamer into the run and allowed it to flow with the current to the end of the pool. Stripping the line in at a slow pace I saw a dark object move to the fly and then back off. Several more casts and nothing. Maybe that follow was to be my best chance to hookup on this last few casts on Red Brook. Still casting and hoping for a strike. I was granted that strike in the form of a hard one, it came just as the fly straightened at the end of the drift. A few more casts and another hard strike, only this time the fish was on. A battle took place and from what I felt I knew it was a nice fish. As the fish came close I could not believe its colors. I placed my hand in the water to lift it up. A true beauty. One of Red Brook's finest. 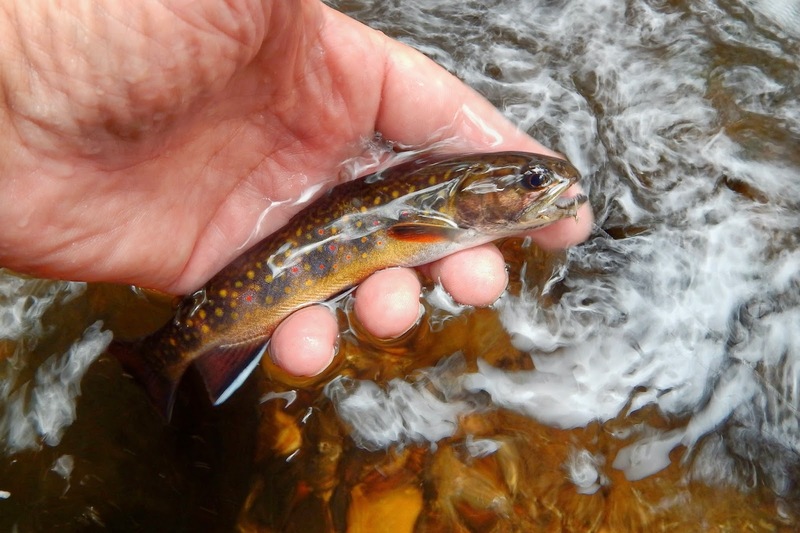 The brook trout was photographed and released. It truly was a fitting end to the last casts on Red Brook. Who would have thought it was possible. When I started this blog I never thought there were so many interested in these intimate little waters, quiet places with wonderful wild trout and the simple way of angling for them. The other day "Small Stream Reflections" surpassed 500,000 page views. This blew me away and humbled me to no end. So to show my appreciation I'm offering a few flies. Just comment on this post and I will select the name from a hat draw. I will make the selection on Saturday October 18th. Thank you so much for all that you have added to this blog. I hope you'll continue. It was a fine October morning as I set out to fish a little stream. The sun was already up and doing its best to highlight the color scheme that nature was unfolding. The air was crisp with a slight breeze. The stream was glistening in the sunlight and the red maple leaves floating downstream stood brilliant. This stream has always been brook trout water. When your fly was taken you could bet your rod it was a brookie. The last few years have seen changes here and more and more browns have been showing up in the mix. There are those who would say that's not good, and they should be stopped. Maybe so but I believe that the stopping of the brown should have taken place in the 1800's. The fact is that they are here and they are wild. I only hope in this stream the brook trout and the brown can live together. While Autumns flora may not show the vibrant colors of Spring and Summer, it does have that sparkle. Even in its dead rotting state there is some beauty. In this section I cast my fly. I watched it move through the riffles and catch itself on a leaf that was floating down. I lifted the fly up and shook the leaf back into the water. Casting again, the fly passing along the riffle suddenly went missing. I set the hook and this time it was not a leaf. The beautiful wild brown was at hand. Its dark body with vibrant red spots encircled with blue halos and black spots that were not to be outdone. It's fins were large and the tail seem to show the power of this fish. I placed the brown into the stream and watched it swim away. It is here that I sat after the release and poured myself a cup of coffee. As I was drinking I observed what appeared to be a rising fish. That's not really uncommon accept it was taking place in a fast riffled section of water. It took me a few minutes to finish my coffee, and in this time the fish continued to rise. I tied on a Adams parachute and drifted towards the rising fish. As it neared the the spot a splash occurred and soon a second brown was at hand. The brown was a mini carbon copy of the brown I had taken only minutes before. What a day.